Horrible pirates. Brrr! But you should not be scared, cause in this game you will be one of them and you will have to fight with all foes on the ship. Display your courage and everybody will be proud of you! 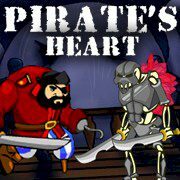 Do you like a pirates and a cool adventure? We propose you to play a fantastic game where you have to imagine that you are a real pirate and you have to save your ship from all enemies. Your ship could also be fired, but do not be afraid, just jump it over. You have a big sword and with the help of it you can kill everyone you will meet in your dangerous way. You will face even to a very big jellyfish, but we know that you are very courageous and you can run all obstacles. Use arrows and tips, try to collect all coins and you will be the best!